The Ryan FR-1 and XF2R-1 represented a creative solution to an interesting problem. Towards the end of WWII, the Navy realized that jets were the wave of the future. However, jets needed long runways and could not be adapted for carrier use at the time. In 1942 the Navy decided that a composite powerplant solution was necessary. Ryan's proposal was accepted and the FR-1 Fireball was born. There were more proposals from Ryan but they never went into service after the war ended. Surprisingly, no injection kit of this attractive aircraft exists in 1/48 scale. The Collect-Aire offering is a double resin kit. Many parts are common. I would advise that modellers get the appropriate Ginter book, because many of the common parts need to be modified slightly when they were adapted to the Darkshark. For example the Darkshark did not have machine guns on the wings so you will need to fill and sand. Another example is that the Darkshark did not have a tailhook so you will need to fill and sand the bottom of its fuselage. The kits went together without too much puttying and sanding. The surface engraving is good and consistent. The wings are solid resin and they make for somewhat heavy models. Fortunately the landing gear is metal and it seems to support the models just fine. Brass wire is provided to do the engine pushrods for the Fireball. Study the plans and the provided parts because there are a few extra parts provided that are needed but not shown on the instructions. I wanted to use the fuel tanks provided but I did not since I could not find any pictures in the Ginter book that matched their outline. The kit tanks look to me as if they came from a Monogram P-51 kit. I used Testor's ModelMaster paints for the project. I darkened the Navy Blue paint for the Darkshark since the color seemed very dark in reference photographs. The decals were pretty rough and it took me quite a while to get them to snuggle down even though the surface was very glossy. After many MicroSet applications and after a coat of Testor's semigloss finish they eventually looked good. All in all Collect-Aire's Fireball and Darkshark was a fun build. 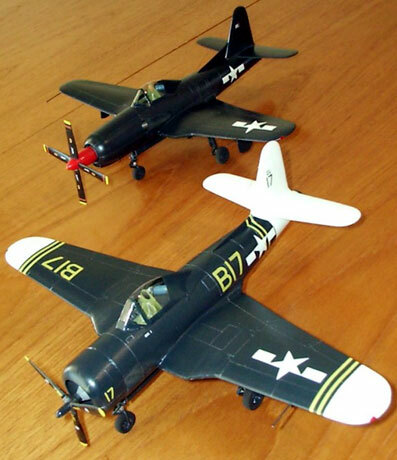 They look great together, next to my other US Navy planes. I think this combination kit is now nearing the end of its production life.